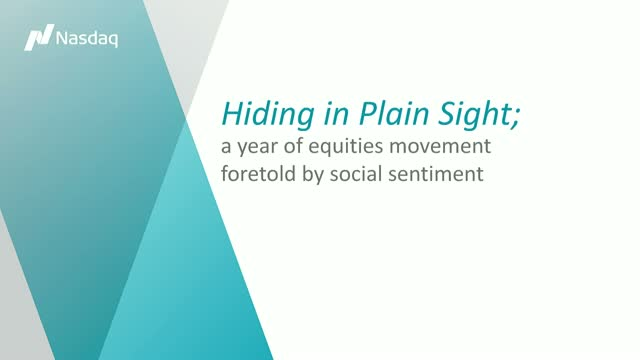 Sentiment data covered in this session is derived in real time from full access to Twitter feeds + other social media platforms in a universe of 1,500+ tickers in the Russell 3000. Oliver Albers leads Nasdaq’s sales and account management teams for the firm’s Information Services business line. Encompassing core data products, index creation and ETF partnerships, Nasdaq Dorsey Wright, and Nasdaq’s machine intelligence initiatives, he is responsible for bringing to market next generation solutions that touch every type of capital market participant—advancing their trading strategies and infrastructures. Gautham Sastri is a seasoned technology entrepreneur and investor with over 30 years of experience in signal processing, cloud computing, and intelligence gathering. The former COO of SGI, Gautham holds 3 patents and has published 40+ papers on signal processing. He has a track record of tackling big data problems in areas that range from seismic processing to weather forecasting to large-scale simulations/data analysis for government agencies. Nasdaq Analytics Hub launched relative strength and trend analysis to objectively evaluate U.S. stocks for investing purposes. Matt Patterson, Co-Founder & Managing Director of 7Handls joins Jill Malandrino at Inside ETFs in Hollywood, Florida. Joe Barrato, CEO of Arrow Funds joins Jill Malandrino at Inside ETFs in Hollywood, Florida. Paul Kim, Managing Director, ETF Strategy at Principal Global Advisors joins Jill Malandrino at Inside ETFs in Hollywood, Florida. Bill Belden, Managing Director, Head of ETF Business Development at Guggenheim, joins Jill Malandrino at Inside ETFs in Hollywood, Florida. Jay Gragnani, Head of Nasdaq Dorsey Wright, joins Jill Malandrino at Inside ETFs in Hollywood, Florida. Mannik Dhillon, President of VictoryShares and Solutions, joins Jill Malandrino at Inside ETFs in Hollywood, Florida. Bill Housey, SVP & Sr. Portfolio Manager, First Trust joins Jill Malandrino at Inside ETFs in Hollywood, Florida. Marc Chaikin, Founder & CEO at Chaikin Analytics joins Jill Malandrino at Inside ETFs in Hollywood, Florida. Sal Bruno, Managing Director & CIO at IndexIQ joins Jill Malandrino at Inside ETFs in Hollywood, Florida. Dave Gedeon, VP, Head of Research & Development at Nasdaq Global Information Services joins Jill Malandrino at Inside ETFs in Hollywood, Florida. Dan Ahrens, Managing Director & COO at AdvisorShares joins Jill Malandrino at Inside ETFs in Hollywood, Florida. Sean O’Hara, Director at Pacer Financial joins Jill Malandrino at Inside ETFs in Hollywood, Florida. Dan Draper, Managing Director & Global Head of ETFs at PowerShares joins Jill Malandrino at Inside ETFs in Hollywood, Florida. Simeon Hyman, Head of Investment Strategy at ProShares joins Jill Malandrino at Inside ETFs in Hollywood, Florida. Bjorn Sibbern, EVP, Global Information Services at Nasdaq joins Jill Malandrino at Inside ETFs in Hollywood, Florida. Noah Hamman of AdvisorShares joins Jill Malandrino at Inside ETFs in Hollywood, Florida. John Frank, QQQ Equity Product Strategist at PowerShares joins Jill Malandrino at Inside ETFs in Hollywood, Florida. Matthew Bartolini, Head of SPDR Americas Research at State Street Global Advisors joins Jill Malandrino at Inside ETFs in Hollywood, Florida. Uncovering underlying movement in the markets with unique insights. Nasdaq Global Information Services (GIS) gives market participants the ability to see, measure, and act on opportunities across asset classes, and over time, through advanced analytics built on core—structured and unstructured—data, indexes, and exchange-traded products, providing financial institutions and investors with real-time, intra-day, and post-trade information and transparency.